LogicInMind releases Slideshow Remote 2.6 with an exclusive AirPlay function to wirelessly stream PowerPoint slides to the all-new Apple TV. With more than one million Apple TVs sold in three months, more and more Slideshow Remote users can take advantage of this unique feature during their professional meetings and presentations. Slideshow Remote is a wireless remote control for Windows PowerPoint. This easy-to-use application lets presenters advance slides from their iPhone. The advanced features will benefit presenters who can better communicate and impress their audience: preview slides, quick-jump to any slide, read personal notes, download the presentation and view slides without a computer. 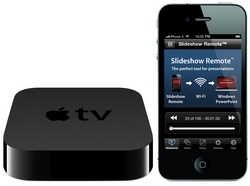 Mobile users will appreciate the ability to easily redirect Slideshow Remote output to a monitor or a projector using the Apple VGA adaptor, as well as any high definition television using the new Apple TV. “Slideshow Remote from LogicInMind finally puts the controls in your hand, and allows you to focus on what a presentation should really be about: presenting rather than wrestling with technology”, said Bonnie Eisenman, 148Apps reviewer. Slideshow Remote is available in Apple’s App Store for $4.99 in the U.S. and priced accordingly in other regions. It requires a personal computer, Microsoft Windows (XP/Vista/7), Microsoft PowerPoint (2003/2007/2010), a Wi-Fi network (LAN or ad hoc) and Logic Server, available as a free desktop program from LogicInMind. AirPlay requires the new Apple TV. External display requires a compatible monitor, Apple VGA adaptor and an iPad/iPhone 4/iPod touch 4th generation. AirPrint requires iOS 4.2 and a compatible printer. Mac is not supported at this time. Please visit logicinmind.com to learn more about Slideshow Remote, including an extensive feature list and image gallery. Journalists and application reviewers are invited to contact us to test drive Slideshow Remote using free promo codes. LogicInMind is a professional software developer devoted to create innovative applications for mobile users. The company’s success is based on leadership in innovation and customer satisfaction. LogicInMind has donated 10% of its 2009 and 2010 gross income to the Red Cross to support the community.